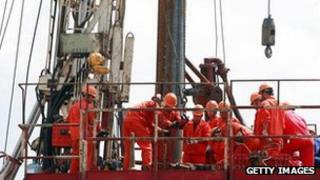 China has knocked the US from its top spot as the world's biggest net importer of oil, US government data shows. The country's fast-growing economy, as well as the rise in car sales, has led to its new status, according to September's data. Oil consumption in China had outstripped production by 6.3 million barrels a day, said the Energy Information Administration (EIA). In the US, the figure was 6.1 million. China's own oil supply has been outstripped by its economic boom, and its oil fields have been damaged by flooding during the past few months. The country had had to import to make up the shortfall, said the EIA. It predicts the trend will continue into 2014. The US uses 18.6 million barrels of oil per day compared with China's 10.9 million, despite having a population a third the size of China's. But the US is increasingly able to support itself after the growth of its domestic hydraulic fracturing, or fracking - a new technique of drilling for gas and oil from shale rock. It has attracted controversy from environmental campaigners concerned about the large quantities of water used and the potential danger of carcinogenic chemicals. The campaigners say the chemicals could escape and contaminate groundwater. Jason Gammel, head of European oil and gas research at Macquarie, said he expected the trend to last for the next five years. He said he expected America to produce 20-22 million barrels of oil per day by 2022. Mr Gammel said: "The US has moved very quickly to utilise fracking and horizontal drilling activities." But he said such an approach would be difficult for China to mimic, as the US was already well prepared to take advantage of the new techniques, for example with its large oil field services.